When it comes to warehouse productivity measures, our industry tends to zero in obsessively on the picking function. Look at the metrics: we calculate and compare pick speeds, track hourly production vs. cost per pick per SKU, map inventory movement, fret over total fulfillment capacity, design pay-for-performance incentives, and whine about labor shortages and worker motivation. But by taking such a myopic view of supply chain operations, it’s easy to overlook other, more upstream factors that can slow – or even stall – pick efficiency. In other words, you can’t always pick your way to productivity. You’ll never spot the problem if you’re looking in the wrong place. It pays to expand your focus to include the processes that support your picking operations. One common-but-often-missed sticking point is the pick-face position, especially in omnichannel fulfillment. Obviously, even the most nimble pickers can’t pick product that’s not there for the picking. When putaways are out of sync with fulfillment requirements, your picking operation is forced into a holding pattern, either waiting for inventory items to be replenished or traveling to locate and retrieve them. Not only is throughput compromised, performance-conscious workers can feel frustrated; if performance is evaluated on pick speed and efficiency, they might even sense they are being undermined. For warehouses and distribution centers that support brick and morter retailers, ineffective replenishment processes can lead to chronic out-of-stock issues that dramatically impact the organization's bottom line. A well-supplied pick-face appropriately positions appropriate product in the appropriate place at the appropriate time and in the appropriate quantities, so that pickers can focus doing their jobs effectively and efficiently. Workers are more satisfied, and fulfillment performance improves. So before you nitpick your picking operation, take a look behind the scenes. Is your replenishment function keeping up with your pickers’ performance potential? 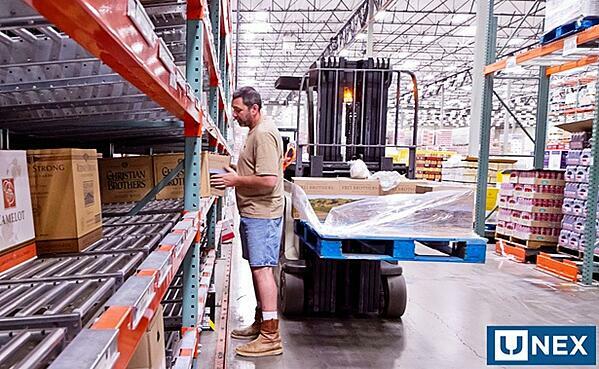 UNEX order-picking solutions put the pick-face in front of or close to the picker for faster fulfillment. UNEX solutions boost storage density while keeping products at the point of pick, reducing the number of touches required to replenish each pick-face and allowing pickers and stockers to work simultaneously without interruption. To discover ways to pick up pick performance, contact your UNEX Pickologists today.